As the more assiduous comics internauts will already have noticed, I took part in the recent selection of the year’s best comics criticism hosted at The Hooded Utilitarian. Run by Ng Suat Tong, it was put together by a panel that also included head utilitarian Noah Berlatsky, cartoonist and commentator Frank Santoro, and the critic Tucker Stone (as well as a sixth judge who unfortunately had to withdraw). For more on the process itself, see Suat’s explanation in the posting of the final results. Dirk Deppey, “The Man Who Couldn’t Shoot Straight” (on Paul Levitz), The Comics Journal/¡Journalista! Noah has already written an insightful post about most of these — one of his best pieces in a while — and I largely agree with his comments. And Tucker has also weighed in smartly on a number of them, so I will refrain from adding to the verbiage and merely encourage you to seek out and read any or all of these pieces. That being said, let me add a few words on those not on Noah’s list: Jeet Heer’s review of Crumb’s Genesis is emblematic of his style and approach. Invariably genial, Heer is best when he’s genuinely interested in his subject, less so when he doesn’t like it. What sets him apart, however, is the impressive literary and comics erudition, as well as the careful research he brings to the table. His analysis of Crumb, while shorter and never quite plumbing the depths reached by Robert Alter in his great critique, he manages to situate the work in its historical context; to analyse Crumb’s interpretative strategy, as well as a number of his specific choices; and to suggest a thematic undercurrent entirely consistent with the cartoonist’s oeuvre as a whole. All in lucid, precise language. A model review and perhaps his best in the past year. I pushed especially for Rilestone’s analysis of Watchmen, which almost didn’t make the cut. Long and somewhat involved, it may seem daunting to the internet reader, but it fully rewards attention. It tackles head-on the cosmology at the heart of all Alan Moore’s work, crystallised with lucidity in Watchmen, and exposes its fault lines. It’s as precise and sympathetic a reading as any I’ve read of the book, carefully building a systemic critique of Moore’s methodology — more occupied, at times, with making the clock tick than with the truth of the moment. If I understand correctly, it provided an important source of inspiration for Tom Crippen’s excellent Comics Journal essay, “Age of Geeks”, in which he smartly, but ultimately inaccurately, interprets this obsession with structure as a manifestation of ‘geekism’, which he — in a bravura turn — weaves into the fabric of postmodernity. This is a rather problematic hypothesis, claiming for the present age a greater preoccupation with simulacra than any previous time, but it’s presented with such verve and with so many smart observations that one feels compelled to engage and, as Noah writes, address one’s disagreement with it. But enough of that. My main regret about the list is that it lacks works by two of my favourite critics. One is Bill Randall, whose “Bring the Noise” (on the arrival of manga on American shores and the enduring appeal of Japanese popular culture, and also written for TCJ #300) was nominated. I refrained from voting for it because I found it somewhat disappointing. Its crackling prose, evoking the author’s first experiences with manga, seemed to me to promise more than ultimately it delivered. It seems to peter out, failing to provide the strong analysis of the current state of manga in the West that at least I was expecting having followed Randall’s must-read column in the Journal since it debuted some years back. We could only nominate writing available online; if print work were allowed I would have nominated his essay on Dousei Jidai in TCJ #295, which I think was probably his standout comics essay of the year. However, I regret now not doing my part to get “Bring the Noise” in there, despite my reservations — it’s still pretty damn good. Read it. The other missing critic is quickly becoming my favourite regular writer about comics: Shaenon Garrity. Smart, incisive, concise and very funny, she’s pretty much the full package. However, when it came down to the vote, I couldn’t find anything by her that seemed substantial enough. Her Chris Ware piece only went online on January 4th, which was too late, but it would surely make this year’s list. It’s among the best critiques of Ware I’ve read, in that it really nails the difficulty of sustaining the sense of alienation that Ware has honed over the years, without descending into rote myopia. For all its assets, I agree this is the problem of the Rusty Brown storyline, and the fact that Ware seems to be distancing himself from it somewhat in his other ongoing work, Building Stories — which seems the more emotionally complex work of the two — is heartening. So, yeah, Johanna Draper Carlson is right that the list lacks manga and female perspectives — it could have included them and almost did. But still, I think it’s a pretty great list. It is encouraging that there’s actually that much good comics criticism out there these days, even if we still have a long way to go before we can compare ourselves with other media. I guess the appearance of worthwhile critical voices is natural, given the remarkable development of the medium over the last decade and a half or so — they may lag behind, but the critics eventually get there! And the past year has seen positive developments. The changes at the Comics Journal were kind of bittersweet but, I think, ultimately the right direction to go, and despite the website still looking like something devised at the beginning, not the end, of the decade, it is certainly delivering its share of quality criticism (my worry is what the hell has happened to the magazine’s once strong journalistic coverage of comics/industry news, but that’s another discussion). At the same time we’ve seen consolidations of both the Comics Comics and The Hooded Utilitarian blogs, with new writers added to their rosters making them essential reading for anyone interested in good writing about comics. And Tom Spurgeon, Joe McCulloch, Sean Collins, Dirk Deppey, Brigid Alverson, Rob Clough, Douglas Wolk, Domingos Isabelinho, Tucker Stone, Craig Fischer, Eddie Campbell, and the folks at Same Hat!, as well others I’m now forgetting, continue to deliver interesting work, while new interesting blogs such as Co-mix are popping up. And this is without taking into consideration non-English-language writing (which we couldn’t include on the list), especially the excellent du9.org, which continues to be one of the best resources for comics criticism anywhere on the web, and Pepo Pérez’ fine Es muy de cómic. Of course, that’s just the blogosphere — mainstream coverage is still far from great, although good work pops up here and there, as our list demonstrates. Er, I better stop here. (Oh, if you’re interested, check out the Bunker’s comics criticism year-in-review for 2007). 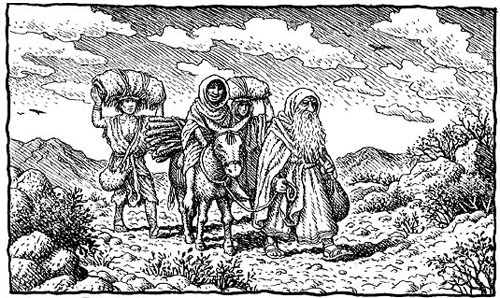 Image from R. Crumb’s Genesis. Very interesting, clever and funny piece on Watchmen. Oh sorry, Rilestone’s. I haven’t read yours on Rackham yet (but am doing so right now). Oh, that’s an old, rather sophomoric thing; I was thinking about Crippen’s piece? Ah! I got that it was inspired by Rilestone’s essay, but not that it was about Watchmen per se, it’s next on the list! Hmm, I disagree with most of the stuff Crippen writes in his article, although I see where he is coming from, and his arguments are very well presented. I certainly don’t hold From Hell in as low esteem as he does, on the contrary I think it’s pretty close to Watchmen in greatness. Watchmen (and From Hell) is in no way perfect, but it’s still an awe-inspiring work, that we still discuss 20+ years since its conception. It seems Crippen is beating Watchmen with a conceptual geek-stick, i.e. evaluating Watchmen from a fanatical fanboys perspective, rather than looking at the work for its own merits. And call me a geek, but I enjoyed the movie, which (of course) doesn’t compare to the comic. I think he’s onto something in his analysis of how Moore builds most of his work on systems of interconnectedness, clockwork-like structures, and this is indeed postmodern, but at the same time I don’t agree that the main motivating factor is ‘useless’ ‘geekism’; it rather seems to reflect a deeply held belief in such a cosmology, full of meaning. Rilestone’s take on the same issue is more sensitive, I think. More horn tooting: re: the Watchmen film. A great piece of critique! I would probably share most of your sentiments if I were to deal with the movie critically. However, I think it’s a shame you don’t mention the fantastic montage sequence in the beginning, which, by using the film formats strengths, elegantly give us a lot of information on the back story. I see what you mean about Rorschach’s voice, but I think Moore read it out in the same hoarse voice, in the clip that’s available on youtube. Also, I have ‘The ultimate cut’ (he), and it has the newstand scenes, and they are pretty terrible, there’s this sub-plot with the knot-tops bullying young Bernie, which I have no idea why they put in there. They even interlaced the animated feature of Tale of The Black Freighter in the actual film, which is extremely annoying, and adds absolutely nothing to the main narrative. The only good thing in the extended version, is the murder of Hollis Mason, which have some nice cross-cutting of Nite Owl I fighting Nazis. Yeah, Moore kind of used that voice too — it’s ridiculous. I wasn’t aware the extended cut was out. I don’t know if I care, but perhaps I should check it out. Oh, I agree that the opening sequence is pretty good, it’s just… the use of music is so *obvious* throughout the film, and I can’t help but feel patronised a bit by the lacing of “The Times They Are A-Changing” there. There seems to me a kind of annoying baby boomer reverence going on. (Of course, the absolute worst, and the choice that kind of says all, is the horrid cover version of “Desolation Row” at the end).